Making It As A Middle School Teacher: Look! The final tweaks are underway, but I couldn't wait any longer to share my brand-new look with you! 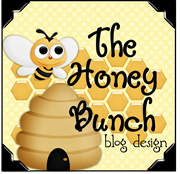 The gals from Honey Bunch Blog Design are absolutely awesome to work with! You are looking good! The Honey Bunch Girls really know their stuff! Aren't they awesome??? I love this! I'm a new follower!